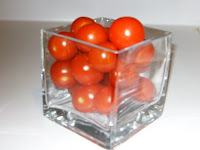 When the meal is business and your salad includes pretty little cherry tomatoes, consider them decorative elements. Think of them as a bit of color added to the plate but not to be eaten. Why? Because they are potential flying objects. Can you be sure you’ll be able spear them with your fork without having juice fly onto you or your neighbor? Or have tomato fly through the air? Save tomatoes for when the meal isn’t business. Otherwise, enjoy the color, but leave them untouched, protecting you and your neighbors.